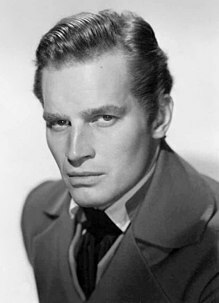 Charlton Heston (October 4, 1923 – April 5, 2008) was an American actor. He had many big roles, such as playing Moses in the movie The Ten Commandments, astronaut Colonel George Taylor in the movie Planet of the Apes, the dystopian 1971 The Omega Man and 1973 Soylent Green. Heston played Judah Ben-Hur in the Academy Award-winning Ben-Hur. He was born in Wilmette, Illinois on October 4, 1923. He was raised in St. Helen, Michigan. Heston studied at New Trier High School and at Northwestern University. Heston was also known for his politics. When he was young he held liberal views and marched with people such as Martin Luther King, Jr. for civil rights in the 1960s. It was rare for a Hollywood actor to be for such causes at that time. Later in his life, he was for conservative causes such as gun rights. He was president of the National Rifle Association, a group that is for the rights of gun owners, from 1998 to 2003. In July 2003, he received the Presidential Medal of Freedom at the White House from President George W. Bush. Late in his life, Heston had Alzheimer's disease. He died of pneumonia, aged 84, in Beverly Hills, California. ↑ Welkos, Robert W. and Susan King. Charlton Heston, 84; actor played epic figures. Los Angeles Times. April 5, 2008. Retrieved April 12, 2010. ↑ Charlton Heston Dies at Beverly Hills Home. FoxNews.com. April 5, 2008. Retrieved April 12, 2010.